Microdosing is becoming a buzzword in the cannabis community, but what exactly does it mean? We caught up with Andrew Mieure, owner of Colorado-based Top Shelf Budtending and a leading authority on budtending for social use. He offers nuanced insights about microdosing, or as he’ll explain, microserving, and offers some helpful tips. Weed Reader: What is microdosing and what are the benefits? 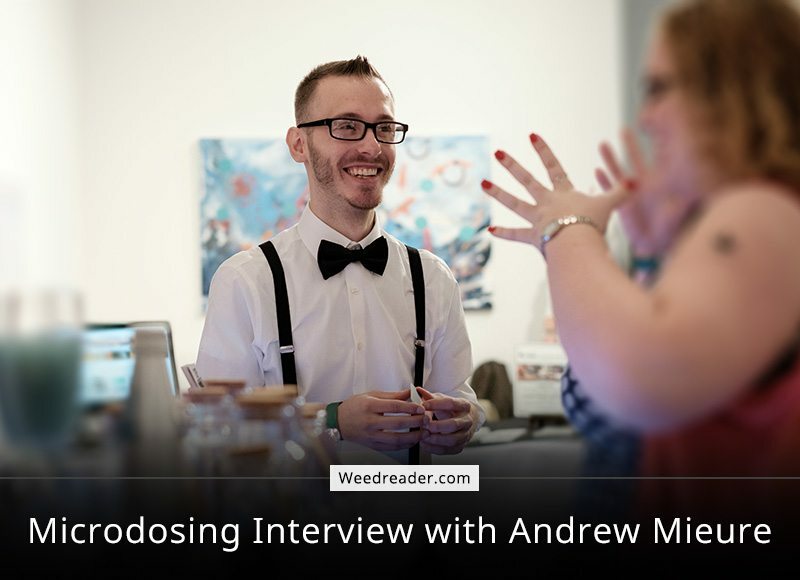 Andrew Mieure: Microdosing is the act of using cannabis in very small doses to reach a medical benefit without some of the unwanted side effects normally associated with larger doses of cannabis. (Anxiety, short term memory loss, sedation) The sizing of a “microdose” can vary per patient or consumer since each individual has a different tolerance, but, generally speaking anything 1mg to 5mg for edible products, extremely small dabs of concentrates (pin head sized) or 1 small (1-2 second) puff from a joint or pipe. This practice ensures that the patient or consumer is still getting a steady supply of cannabinoids without being too medicated to work, play or otherwise interfere with their daily life. Microdosing is a wonderful practice and I believe more consumers should start experimenting with it. WR: What is microserving and why the distinction? AM: With the emergence of cannabis social use and cannabis based parties, we decided that the term “microdosing” seems a bit too serious for parties. For many people “dosing” sounds like something your doctor would instruct you to do, or something you would read on the back of a Nyquil bottle, not exactly the thing you want to be told at an event. Even more important is the negative association that the word “dosing” has with “overdosing.” With much of the United States dealing with an opiate epidemic, we want to do our best to provide a safer alternative to harmful pharmaceutical drugs, removing the term “dosing” completely allows the guests to feel safer about the cannabis they are consuming. Instead, we have started to use the term “microserving.” Microserving is the exact same thing as microdosing, but geared more towards the social use and recreational consumer. WR: What are some best practices for budtenders in social use settings? AM: First, if you dealing with non-industry guests or guests new to cannabis, always be sure to inquire about their tolerance, experience with cannabis, preferred consumption method and normal place of consumption. You could do this all one-by-one with each guest or at the start of the event. Always start all guests out with small servings and monitor their progress throughout the duration of the party. We even go as far as creating a ticket system for joints and edibles to ensure that the guests are not consuming too much. Second, budtenders should be educated in social use specifically. While many budtenders are trained on how to tell patients what they may need in a dispensary setting, social use budtenders allow their guests to see, smell and sample the cannabis at the event, adding another layer of complexity to their recommendations and practices. Some of the biggest mistakes I have seen at social events would be some of the easiest and most simple things to keep in mind. Simple things like having alcohol swabs, wearing gloves, and keeping everything sanitary should be non-negotiables for any social use budtender. Finally and most importantly, have fun! While being educated, serious and airtight about what we do, it is imperative to make sure the guests are having an amazing time at our event. WR: What advice would you give to cannabis novices who are attending their first social use event? AM: First, please make sure to tell your budtender everything about your tolerance, experience with cannabis and if you have any types of allergies or specific medical conditions for them to take into consideration. Second, be very aware that consuming cannabis in social settings can feel much different than smoking in your home or at a comfortable location. We always advise brand new users to try cannabis at home first before coming to a cannabis event, as it is easier to dial in how you feel in a comfortable environment versus when you are in a social use setting which can cause some anxiety. If you do decide to use it at a social event, please only use very small amounts and do not mix it with any other drugs or alcohol. Third, never, I mean NEVER give into peer pressure. If you do not want to try cannabis, there is no pressure. It is your body and your choice. Never let anyone else pressure you into using cannabis when you are not one hundred percent comfortable. Cannabis affects everyone differently. Just because your friend can smoke 3 joints back to back does not mean you can too. Tolerances vary wildly and some users are prone to anxiety. Cannabis is not alcohol and it is up to us to show the world that social cannabis use is a completely different experience where peer pressure has no place. If you want to microdose flower, I would suggest getting small portable vaporizer or a small one-hitter pipe that allows you to put in only a tiny amount of flower, avoiding any of those accidentally massive bong rips.